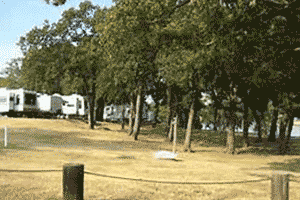 Buncombe Creek Campground is located on Lake Texoma in Oklahoma’s Cross Timbers Region close to Kingston, Oklahoma on the northern side of Lake Texoma. Post and blackjack oaks forest the rolling hills of the region. Deer, turkeys, bobcats, hawks, waterfowl and songbirds are abundant around the lake. A mix of waterfront campsites, electric and water hookups make Buncombe Creek Campground at Lake Texoma a popular destination. Each of the 54 primarily shaded campsites comes with a picnic table and charcoal grill. Other amenities include a comfort station with showers and flush toilets, vault toilets, two boat ramps, a dock and a dump station. Buncombe Creek Campground is operated by the Army Corps of Engineers. September 1st through September 30th – All campsites will be available on a first-come, first-served basis (no reservations are accepted). Gate attendants will not be on duty; therefore, camping fees should be paid at the honor vault station located near entrance of park. Camping fees are posted at fee vault station. Restroom and shower facilities will be available during this period. Please contact the Lake Texoma Project office at (903) 465-4990 x 0 for additional information. October 1st through March 31st: Park will be closed. The nearest Corps of Engineers campgrounds for off-season camping and boat launching are Juniper Point West or Caney Creek.